President Juan Manuel Santos speaks during his visit to Cucuta. Colombia will tighten border control in response to a massive influx of Venezuelans fleeing their country, President Juan Manuel Santos said Thursday. “The arrival of Venezuelans to the country will be controlled, orderly and should be done within the limits of the law,” Santos said during a visit to Cucuta, a city on the border with Venezuela. To curb illegal migration, Colombian authorities will no longer issue temporary border crossing cards, which granted 1.5 million Venezuelans short visits to Colombia to buy food and medicine. Only those with passports and already issued temporary border crossing cards will be allowed to enter Colombia. The president also announced the creation of an official registry of Venezuelans in Colombia—to ease Venezuelans’ access to employment, health and education services. Once registered, Venezuelans will receive a voucher that displays their legal status in Colombia. A Migration Task Force (GEP) was also created to monitor and ease possible tensions between Colombians and migrants, curb human trafficking, and punish smuggling between the two countries. 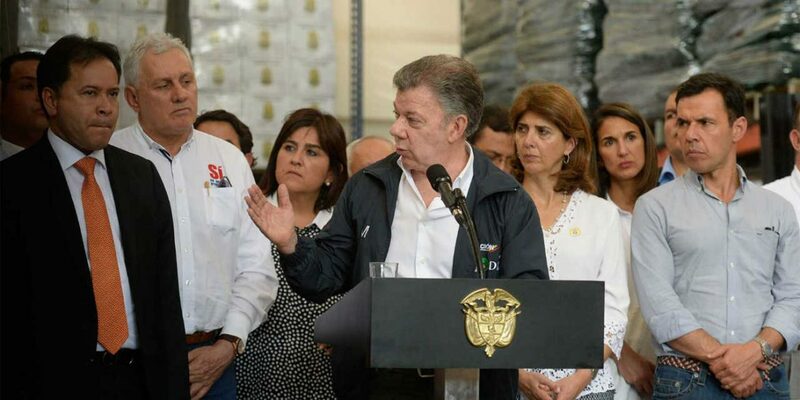 “We will not permit that anyone comes to commit crimes in Colombia,” Santos said. Millions of Colombians migrated to Venezuela during an oil boom in the 1970s and 1980s. Millions fled to the neighboring country at the height of Colombia’s armed conflict in the late 1990s and early 2000s. According to Colombia’s migration authority, more than 200,000 Venezuelans fled to Colombia last year amid a deepening political and economic crisis in the neighboring country.